When Tom Wolfe died in May, one thought that crossed my mind was that he and Haight-Ashbury both have richer legacies because he went searching for Ken Kesey in 1966. That search, of course, resulted in Wolfe writing The Electric Kool-Aid Acid Test, which for my money is still the best piece ever written on Haight-Ashbury. I’d also rate it as Wolfe’s greatest book – the book that established his reputation and the one he never outdid. 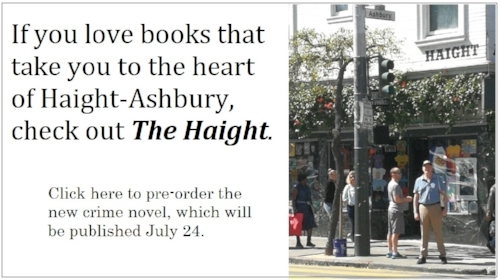 It also enriched the legacy of Haight-Ashbury, explaining to generations of readers what makes the place so magical. I read it after first visiting Haight-Ashbury in 1981, and read it twice more while researching The Haight. In 1966, Wolfe was a New York-based magazine journalist and essayist who heard about a West Coast author who had become a fugitive in Mexico after being busted on a drug charge. Ken Kesey was best known as the author of One Flew Over the Cuckoos Nest and Sometimes a Great Notion. Kesey was a born leader, a championship wrestler, and a scholar. He had spent much of the 1960s leading a band of misfits called the Merry Pranksters in San Francisco’s Haight-Ashbury neighborhood, which was becoming known as a hotbed of LSD. After being arrested for marijuana possession, Kesey fled to Mexico. The more Wolfe learned about Kesey, the more drawn he was by the story until he finally traveled to Mexico in search of him. (Wolfe learned of his location from the novelist Larry McMurtry, a friend they had in common.) Wolfe was hoping for a three-part article for New York magazine. On arrival, he learned Kesey had returned to California, where the FBI arrested him again. So Wolfe traveled north, met Kesey in a jail in Redwood City, and began to hang out with the Pranksters in Haight-Ashbury. Wolfe knew he was on to something – a rollicking tale of an outlaw literati, a social study of the blooming Flower Power culture, the burgeoning art scene that led to the acid tests, even the supposed birth of a new religion. He had too much for magazine articles and he spun this yarn into a single book. Hell’s Angels come reeling in, shrieking Day-Glo, then clumping together on the floor under the black light and then most gentle Buddha blissly passing around among themselves various Angel esoterica, chains, Iron Crosses, knives, buttons, coins, keys, wrenches, spark plugs, grokking over these arcana winking in the Day-Glo. The book came out in the heyday of New Journalism, when Wolfe and contemporaries like Truman Capote and Gay Talese developed highly subjective and original writing styles to deliver a pioneering form of non-fiction. Wolfe perfected this in The Electric Kool-Aid Acid Test, using a conventional prose to draw his readers through the story and these out-of-sight passages to create the insanity of the acid tests and the Haight-Ashbury scene. The result was an exemplar of New Journalism and an American classic. The book ensured the legacies of both Tom Wolfe and Haight-Ashbury. It was his finest book, bettering the non-fiction gem The Right Stuff and even Bonfire of the Vanities, the novel that defined the 1980s. And Haight-Ashbury is richer because it was written. Wolfe did not “discover” Haight-Ashbury the way Hemingway discovered the Running of the Bulls. It was well known by the time Electric Kool-Aid came out. What he did was explain and preserve it. Even today, if you were going to recommend one book about Haight-Ashbury to anyone, it would be The Electric Kool-Aid Acid Test. Even though its story of Kesey concluded before the Summer of Love. Some observers of The Haight complain that Wolfe was an outsider looking in at what was going on, but even that strengthens the book. Just the fact that this East Coast intellectual came to San Francisco to write the book was testament to the fact that something was happening on Haight-Ashbury that merited the world’s attention. An insider might have produced a work that was too cliquey, or written for a local audience. What Wolfe wrote is a magnificent piece of literature, and a monument to the neighborhood it describes.